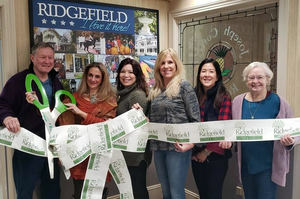 The Ridgefield Chamber of Commerce held a ribbon cutting ceremony to welcome jewelry designer Amy Kahn Russell as a new member! Amy Kahn Russell finds inspiration in motifs and cultures she encountered while traveling abroad and incorporates unusual artifacts and stones collected worldwide into her dramatic jewelry. Transcending seasons and time, her pieces are distinctive and capturing history and geography. The high demand and popularity of her work are directly related to the fact that she painstakingly designs every piece. To heighten designer awareness, Amy Kahn Russell pieces come to each owner with history and a label describing the components. Often the rarity and individuality of the material limit the duplication of style. Amy Kahn Russell jewelry is internationally sold in museum shops, art galleries, prestigious boutiques, catalogs, and specialty stores. Pictured from left to right: Scott Russell, Owner Amy Kahn Russell, Ridgefield Chamber of Commerce Executive Director Kim Bova, Chamber staff Trish Masciotti and Minnie McCartan and Personal Touch Welcome owner Dee Strilowich! Amy Kahn Russell is located at 225 South Salem Road in Ridgefield. Learn more at www.amykahnrussell.com or call 438-2133. The Ridgefield Chamber of Commerce provides benefits-based membership and is a resource and advocate for businesses and non-profits by advancing and promoting the economic vitality and quality of life in Ridgefield.